Japanese knotweed is a herbaceous perennial that can reach heights of 9' tall. Semi-woody stems are erect and hollow and resemble bamboo canes. Leaves: Leaves are dark green and are 4-6" long. Flowers: There are many small greenish white flowers. These flowers bloom in late summer. Fruits & Seeds: Seeds are small, shiny, and black. They are enclosed in a winged calyx that makes them buoyant. Roots: Robust rhizomes grow 6' deep thus creating a dense impenetrable mat. 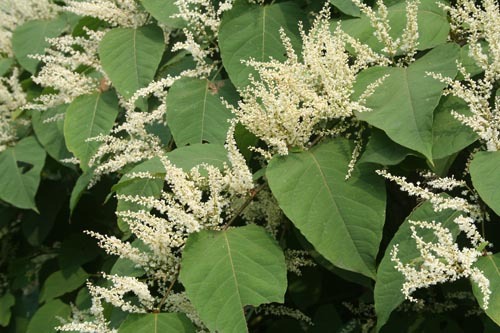 Japanese knotweed invades forest edges, wetlands, fields, roadsides, and urban areas. It poses a significant threat because it will eliminate vegetation and cause erosion. Young stems can produce new roots and shoots if buried or floating. Japanese knotweed is able to break through pavement and building foundations.